Chalachew Mebrahtu, Salvatore Abate, Emanuele Giglio, Fabio Deorsola, Samir Bensaid, Siglinda Perathoner, Raffaele Pirone, Gabriele Centi, “Catalytic performance of γ-Al2O3-ZrO2-TiO2-CeO2 composite oxide supported Ni-based catalysts for CO2 methanation” Ind. Eng. Chem. Res., 2016, 55 (16), pp 4451-4460. Marleen Häring, Asja Pettignano, Françoise Quignard, Nathalie Tanchoux, David Díaz Díaz, “Keratin Protein-Catalyzed Nitroaldol (Henry) Reaction and Comparison with Other Biopolymers“. Molecules, 21 (2016) 1122. Phuoc Hoang Ho, Marco Monti, Erika Scavetta, Domenica Tonelli, Elena Bernardi, Lara Nobili, Giuseppe Fornasari, Angelo Vaccari, Patricia Benito, “Reactions involved in the electrodeposition of hydrotalcite–type compounds on FeCrAlloy foams and plates”. Electrochimica Acta 222 (2016) 1335-1344. Rubulotta, Giuliana; Solmi Matilde, Scientific Illustration part of the article that presents the Gordon Research Conference 2016, Science, 6274, 742‐770 (2016). Andrés Felipe Sierra Salazar, Tony Chave, André Ayral, Sergey I. Nikitenko, Vasile Hulea, Patricia J. Kooyman, Frans D. Tichelaar, Siglinda Perathoner, Patrick Lacroix-Desmazes, “Engineering of silica-supported platinum catalysts with hierarchical porosity combining latex synthesis, sonochemistry and sol-gel process – I. Material preparation“. Microporous and Mesoporous Materials 234 (2016) 207–214. 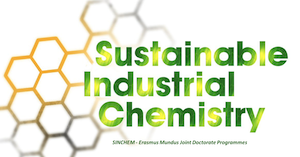 Andrés Felipe Sierra-Salazar, Wing Sze Jennifer Li, Maël Bathfield, André Ayral, Salvatore Abate, TonyChave, Sergey I. Nikitenko, Vasile Hulea, Siglinda Perathoner, Patrick Lacroix-Desmazes, “Hierarchically porous Pd/SiO2 catalyst by combination of miniemulsion polymerisation and sol-gel method for the direct synthesis of H2O2“, Catalysis Today. In press DOI:10.1016/j.cattod.2016.12.021. Kassem Beydoun, Katharina Thenert, Emilia S. Streng, Sandra Brosinski, Walter Leitner and Jürgen Klankermayer, “Selective Synthesis of Trimethylamine by Catalytic N-Methylation of Ammonia and Ammonium Chloride by utilizing Carbon Dioxide and Molecular Hydrogen”, ChemCatChem, 2016, 8, 135-138. Tahrizi Andana, Marco Piumetti, Samir Bensaid, Nunzio Russo, Debora Fino, Raffaele Pirone, “CO and soot oxidation over Ce – Zr – Pr oxide catalysts”, Nanoscale Research Letters 11 (2016) 278. Trevisanut, C, Vozniuk, O., Mari, M., Urrea, S.Y.A., Lorentz, C., Millet, J.-M.M. , Cavani, F. “The Chemical-Loop Reforming of Alcohols on Spinel-Type Mixed Oxides: Comparing Ni, Co, and Fe Ferrite vs Magnetite Performances” Topics in Catalysis 59, 2016, 1600-1613. A.Lolli, Y. Zhang, F. Basile, F. Cavani, S. Albonetti “Beyond H2: Exploiting H-Transfer Reaction as a Tool for the Catalytic Reduction of Biomass” in Chemicals and Fuels from Bio-Based Building Blocks 2016 Wiley-VCH Verlag GmbH & Co. KGaA. Lorenzo Grazia, Alice Lolli, Federico Folco, Yu Zhang, Stefania Albonetti, Fabrizio Cavani “Gas-phase cascade upgrading of furfural to 2-methylfuran using methanol as H-transfer reactant and MgO based catalysts” Catal. Sci. Technol. 6 (2016), 4418-4427.